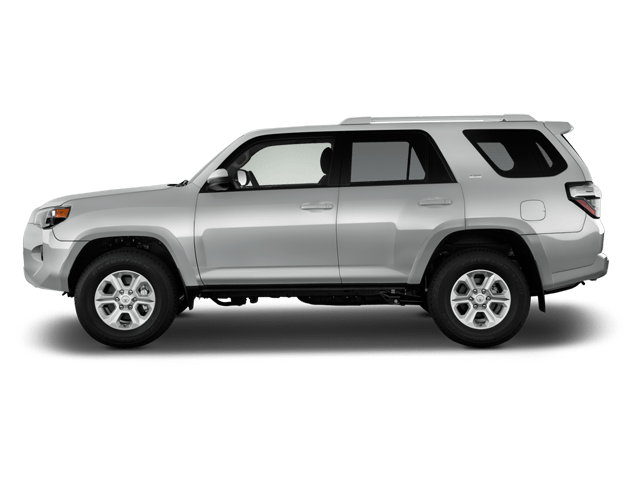 The $58,222 (after freight and PDI) Toyota 4Runner TRD Pro doesn’t have lane-keep assist or blind-spot assist. It doesn’t have a power liftgate (though it does have a power retracting rear window, which is nice), doesn’t have automatic climate control, adaptive cruise control or rear cross-traffic alert. But it doesn’t matter. Not. One. Bit. For one, no one really wants to read about electronic aids when they’re reading about an old-school, off-road master truck like this. For two, it doesn’t matter when you consider what it does have, and it does have one whole heck of a lot. Electronic locking differential. Hill-descent control. Crawl control (more on that in a minute). Off-road tires (swapped for snow tires on my tester). New for ’19 Fox racing shocks – and it does get a backup cam. Which it has to, because it’s 2019. Chances are, if it’s being used for the mud-bogging, rock-crawling, off-road smashing it’s meant for, the camera will likely be covered in grime and useless, but there you go. This here is a no-holds-barred off-road master of a sport utility vehicle that also happens to look ultra-cool in its new Voodoo Blue paint (yes, that’s the actual name, I kid you not! ), though between you and me it doesn’t look that different from last year’s Cavalry Blue - a little more saturated, perhaps. The black wheels with red “TRD” logos are back – perfect – and that logo is now matched by the logo on the front skid plate, which has been painted red for this year. Which, far as I’m concerned, is perfect even if it will get completely caked in grime after about five minutes. The rest of the visual additions for 2019 are minimal; there’s a new roof rack as well as new LED foglights, and that’s about it. And that’s about it because that’s about right. If there ever was a vehicle that did such a good job of blending the old with the new like this does (this side of the Jeep Wrangler and Mercedes G- Class, I suppose) I’ve yet to see it. With the return of the blacked-out grille this is as purposefully-styled as it is purposefully-engineered, and you have to respect Toyota for going a route that tackles both aftermarket off-road vehicle builders and new-SUV buyers all at once. Inside, it’s a similar theme, meaning big, blocky surfaces and details abound, from the non-digital climate control knobs to the massive steering wheel, from the chunky shift lever to the no-nonsense, right angled dashboard. It’s obvious that this dash is here to house the controls, and that’s about it. It’s not here to be a centerpiece of design, or to impress you with a multitude of materials. Indeed, with the exception of the red contrast stitching, infotainment screen and somewhat modernized analogue gauges, there’s very little in here in the way of styling for the sake of styling. That screen, after all, is really only here for the backup camera as while it does display Toyota’s Display Audio infotainment interface, there’s no Apple CarPlay or Android Auto support. Once again, though, I couldn’t care less about that in this instance; all I had to do was load up my favorite playlist before I pushed off, set it to repeat, and proceed to enjoy all that this magnificent machine had to offer. While its looks suggest it would be a bit of a bear around town, it’s actually not. The squared-off styling means it was always easy to place in tighter city situations and while the steering is heavy (you’ve got a lot of weight to deal with on that front axle, after all), the steering radius often surprised me. Not because what should have been a three-point turn became more of a five-point turn, but because of the opposite of that; the turning radius is tight for such a large vehicle, likely a by-product of its having to navigate tight off-road corridors. Add the generous visibility afforded by the tall, square greenhouse (not to mention the backup cam), high seating position (the seat could use a littler more bolstering, however) and you’ve got an offroad-centric SUV that has no problem rubbing shoulders with the delivery vans, taxicabs and busses of the urban grind. Of course, then you get out of that situation and on to the open road, and you get the feeling that this is more the 4Runner TRD Pro’s element. You know, with its big, gutsy 270-hp, 278 lb-ft V6 and all that. Well, it is and it isn’t. And that’s because, though it may have a V6, the power is sent through a 5-speed – five-speed – auto transmission, with fifth being an overdrive gear. The result is plenty of grunt and oomph down low in the rev range at lower speeds, but a vehicle that struggles a little as speeds increase, especially when climbing. Here, the engine seems downright limited by the transmission, not to mention the 2,155-kg curb weight. The throttle pedal also has a lot of travel, so while you may think you’re giving it the beans enough to kick down a gear by applying the same pressure you would in other vehicles, that’s usually only enough to get you about one-third of the way through the pedal’s travel. You need to tip in more than that to get to the power. Eventually, you’ll get there but I did find myself longing for just a bit of a smoother powertrain than I had. Also on my wish-list was better fuel economy, because the 15.8L/100 km we saw denotes quite a thirst. Which, of course, becomes less of an issue as you leave the beaten track, and start to explore roads less travelled. I made sure to take the 4Runner to my favorite network of mountain roads, made all that more challenging in this instance by their being pretty much covered in snow. No matter; you could almost hear the 4Runner laughing as it gobbled up the snow beneath it like movie theatre patrons do popcorn – big, huge chunks grabbed by the talons of the Toyo tires (a Toyota would have Toyos, right? Sorry. I’ll show myself out). Observe as the GSi-5 winter rubber grip, grip, grip so that you feel like they’ve munched through the compact snow right to the tarmac below. Those tires work in conjunction with the traction control and ABS for easy progress in Crawl Control mode. Activated once you’ve come to a stop, selected L4 and pressed a button mounted above the rearview mirror, Crawl Control is basically cruise control for offroaders. Once activated, all you have to do is adjust the speed via the control wheel surrounding the activation button and watch your steering. The system does the rest, and while the ABS activation is quite loud in its report, it’s not so bad if you’re ready for it. Get past that, and it’s a comprehensive system that makes driving in adverse conditions like this that much easier. The function is cancelled once you shift to park or open a door – so don’t be hanging out the door to take way-cool selfies as you’re crawl controlling up a mountainside strewn with loose rock and gravel. Bad plan. While it’s nice to have, Crawl Control is obviously a feature reserved for very specific scenarios, so of course I more often found myself manipulating the various powertrain and chassis systems on my own, a job that never really got old. You find yourself seeking ever more challenging roads, with my jaunt over the forestry roads of B.C.’s Squamish Valley region ending only because there was a gate barring any further progress. Of course, the TRD Pro would probably have found a way over (or through) that, too, but since this wasn’t my car, I wasn’t about to find out. That’s the thing, though. Good cars are nice to look at, mostly comfortable and fun to drive. Very good cars add a little extra, for example some trick performance rubber on an already finely-tuned sports car, or front seats that can be adjusted 1,000 ways in a luxury SUV. Great cars, however, manage a set of intangibles that, somehow, strike you not only as soon as you’re sat in the driver’s seat, but manage the unenviable task of staying fresh and invigorating throughout a given drive, a given year or a given ownership period. While I can’t speak for the latter two, I can absolutely speak for the 4Runner always making me want to come back for more. And that, friends, is no small trick.